I woke up for Day 2 SORE. And with a headache. And feeling nauseous. I really considered a DNS. Farley didn’t need a rider that couldn’t ride effectively. I decided that if I could saddle my own horse, and mount without assistance then I would head out. I tried getting off a couple of times when the headache started to get better but it quickly came back, so I decided that I would just ride for that day. I knew she could do 50 miles looking good if I got off and ran significant portions of the downhill, but could she actually carry me 50 miles? It was also a good test of my food system. Could I still get down the Goo and elyte caps when I felt this sick? Even though the feel of the elyte caps in the back of my throat made me gag, the Goo didn’t and I felt better and better as I went through the day mentally. I really screwed up my calves on day 1. Not putting those fleece covers on my leathers was a bad idea. Also, I think the wintec has a harder seat than I’m used to on my endurance saddles. And while I was grateful for the covers on my stirrups for safety’s sake, and the wider platform really helped me mount up on the trail at the walk and trot, the “cushiness” and width of the pad makes my knees and feet hurt. I tried to ride the best I could, knowing that I might have to pull if there was any sign that I wasn’t riding well enough and compromising my horse. This is day 1. Note the casual, relaxed atmosphere, the smile that actual meets the eyes, and the relatively correct, upright position. What a pretty picture we make! Day 2? This is before I realized there was a photographer. There. That’s the best I can do. I’m sitting up as much as my to-the-touch-painful-abs allow me to really, who thought riding a horse for 50 miles was a good idea? At least my horse is still moving well. Crap. Another photographer. More notice this time, better smile. Let’s pretend we are having fun. And since we are talking about pictures…….Note the much better position the wintec puts me in than the saddle I was borrowing for Cache creek. (especially the cache creek pic on the far left – I look like a saddle seat rider). I started Farley on day 2 in a hackamore. It’s the first time I’ve started a ride in it – usually I’ll switch to a hackamore on the second half of a 100. But she seemed so relaxed and willing at the end of the first day, AND I had a revelation that the curb chain would keep her from “rooting” at the end of the reins going down hill (which, because I was so sore would absolutely cause me to fall forward out of position). She wasn’t QUITE as calm and willing as I thought. At least if you define “willing” as “the speed I want you to go versus the much faster speed you are trying to go….”. I had a rule on day 2. No passing Karen Chaton. I have similar goals as she does, she was riding a different horse on day 2 than she was on day 1, and there was NO REASON I should be going faster than Karen. I eventually caught up to Karen and fell in behind her, thinking that I would soon watch her disappear ahead of me up a big hill, since I know Farley isn’t in as good condition as Chief is. Instead, to my surprise, we had very very similar paces and the same ride plan. Anytime I thought to myself “I want to walk” and I started to walk, Karen would too. Anytime I thought “this is a good place to trot” she took off trotting at about the same speed I would have gone with Farley if we had been by ourselves. Near the end of the ride there is some beautiful, elevated single track that Farley just LOVES to take at speed, that I probably would have let her….but Karen was walking and even at the time I recognized the wisdom and taking that section easy. No reason to risk death and loss of limb and horse just because you have a horse that is a bit of an adrenaline junkie!!!!!! Anyways……..so I ended up rating Farley in the hackamore a lot more than I have before and Farley was unhappy. So she started tossing her head. I tried growling at her and slapping her neck, but it was spectacularly ineffective. At her worst she was doing little rears as we were going down hill. It was at that point I sorta accidentally let her poll collide with my fist the next time her head came my direction. We sorta repeated that accident a couple more times and she got the point. No more tossing her head. After lunch, when I probably would have normally put her in the hack, she was working off my seat and the suggestion of my hands quite nicely and was much more what I expected. Throughout this day Jessica continued to reassure me that Farley looked completely sound, the vets weren’t just giving anyone A’s, and Farley looked average or above average….and she looked better than she did yesterday. Farley and I finished somewhere around 16th or so and I vetted in. Melissa told me that she looked “really good” and rechecked her back by my request to see if there was any concerns using the wintec for Tevis (there wasn’t anything:)). I immediately ran to Jessica and asked how many other horses got a “really good” from Melissa and was told it was just a handful. Whoo hoo!!!!!! Farley looked great and had gotten through both days with nearly straight A’s. From Vets that weren’t giving straight A’s. And that’s what I just can’t get over. I pull this horse out of a 2 year retirement and do 3 really tough 50’s on her. At a similar pace to what we were doing before she was “retired”. With basically no conditioning. And I’m getting BETTER vet scores. The ONLY thing I notice different is that I can’t come in as hot and have her pulse quite as fast. But we are talking about the difference of coming in at a canter and coming in at a trot. Her CRI’s are still in the high 40’s or low 50’s and her gaits, soundness, hydration parameters, attitude, EVERYTHING IS BETTER. After 2 years off. I cannot wrap my mind around it. And that’s why I was so happy to have a second set of eyes at the vet check. A set of eyes that wouldn’t have hesitated to tell me if she say ANYTHING. And she didn’t. Farley is completely sound and handling this just fine. I’m not naive enough to think that I can jump right into a 1000 mile season, or even a 500 mile season with Farley just because she looked good completing a couple of 50’s after an extended lay off. I think eventually I would pay the price of not doing regular recent conditioning and I would accumulate enough micro injuries during these rides that something would break…….but 3 50’s, Tevis, and then give her 6-8 months off? I think that works. I’m not sure that would work with any horse, (and we will see what happens at Tevis), but at this point I stand in awe of my horse. Physically she is recovering faster after rides, is stronger during the rides, and presenting better at vet checks than ever before. Even though I’ve adopted the attitude of “please find something wrong with my horse” instead of “I’ve appropriately conditioned my horse therefore she is fine”. And so far, every time we return home after a ride and I turn her out in the arena to roll before putting her up, she trots away from me sound as ever, not stiff, and gives me sweet nickers when it’s time to go back to her paddock. I think everyone thinks their horse is the best and has a heart as big as an elephant, but I stand here before you to say that Farley absolutely has the biggest heart I’ve ever seen. This quiet, unassuming, non-descript brown horse has an incredible depth that is scary to behold. I felt like I got a glimpse of it at the end of day 1 when she was taking me home after an incredibly difficult 55 mile ride and she was still strong and forward and floating over incredibly technical trail as if it was a groomed arena. And she absolutely knew she was going out again the next day (this horse never forgets a trail or a ride, and this is her 3rd year at this ride, which we always do 2-3 days at). And to combine that sort of heart and competitive spirit with a horse that has always taken care of me and has NEVER made me nervous, even with my numerous “fear buttons” is something special indeed. A vet at the ride that has watched me do endurance on Minx and continue on Farley laughed at me at a vet check when Farley was rubbing on me, which I HATE!!!!!!! and said that Farley likes to tease me and totally chooses her moments and what she is going to do, and I had to laugh. Because it’s true. She’s subtle and she never throws anything at me that I can’t handle at that moment, but she does play with me – especially at vet checks. I keep thinking back to the trail ride we did in Oroville the weekend after Minx died and how I had an appointment to look at another horse the next day, and how I took Farley out in a hackamore and she said “Give ME a chance. I will be the only horse you need. I have so much to give and will give it to you, if you only give me the chance.” And so I cancelled my appointment the next day and it’s been just me and Farley ever since. I did think with some regret while I was riding on day 2 that Farley could have probably been one of those “great” horses in endurance if she had had a different rider and owner that hadn’t made so many mistakes and had to teach her rider so many lessons. At 14 we don’t have time to start over and make the decade team (this is my 6th season with her doing endurance, but in 2011 we got pulled on the only ride we did, and in 2012 we only did one LD), and with my plan of just doing enough 50’s to get us to Tevis every year, we might make 2K miles, but I doubt we will get to 5K. And I’ll never be brave enough to let her go enough to win a ride, and she’s not flashy enough or a pretty enough mover (and I’m not fat enough….) to get a BC. Which makes her even more special to me. 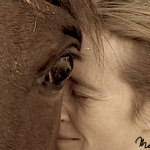 I have a once in a life time horse RIGHT NOW and it is enough that I recognize the fact that she has chosen to share her heart with me, and loves what I love. YES! :fistpump: I’m so happy for you! I can’t stop laughing about everything that went wrong, though. Rosemary noodles. I’m gonna pull something laughing about rosemary noodles. We are just not fit for civilized company. So glad the goo worked! It’s not the tastiest thing I’ve ever eaten but it takes almost no effort to ingest and it keeps you going. My next step with it is to try to figure out how much electrolytes by weight I can put in without tasting the salt, because I think more electrolytes couldn’t hurt for me – I can always skip my s-cap when I goo, or take one anyway if I’m sweating hard. Wow, she was *moving*! Love that photo on day two of the close-up of her legs. The fact she has taught you those lessons, willingly, makes her one of the “great” endurance horses…and together, you guys make a great endurance *team*. OMG I almost burst into tears when I got to the part about the decade team being cumulative. REALLY???????? Then I’m 4 years out of 10 and I can absolutely do a 50 on her every year until she’s 20. That would be the biggest pride of my life. ^^ absolutely! It’s my biggest goal too; I absolutely know the rules. For about the past month, I’ve been doing the liquid “Elete” electrolyte that you add to water, plus my standard Succeed caps. My problem with the caps is I lose track of time and can’t be counted on to take them reliably. The add-in liquid doesn’t change the flavor of water, and I actually like it better than any sports drink. Man, talk about having a tear in my eye from this post! I’m not even kidding. now that is high praise indeed…..
Farley is one hell of a horse. The relationship you two have is really something. So happy for you! Awesome! I knew you could do it! You say Farley is a great horse. And while that is true, you guys together are what makes a great TEAM. You both try pretty hard for each other. I guess I feel a little guilty because I’ve never felt like I’ve met her half way and pulled my own weight. Which is the very definition of a gift I suppose.